Soft Robotics CEO Carl Vause partnered with Dr. George Whitesides of Harvard University in 2013 to explore commercial applications for the ground-breaking soft robotics work pioneered at the Whitesides Research Group, in partnership with DARPA. Soft Robotics was formed to commercialize this research in late 2013 and Carl joined as CEO. Today, Soft Robotics serves customers globally with its patented technology. 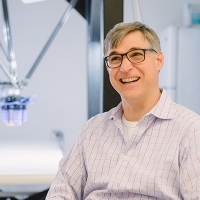 Prior to joining Soft Robotics, Carl held a variety of senior positions in global technology companies. He holds a BSEE from Virginia Military Institute and a MBA from London Business School. He began his career as a Naval Flight Officer in the United States Navy, retiring from the Naval Reserve in 2013.